The giant temple complex of Angkor is one of the world’s most fascinating travel destinations. Several hundred years ago, Angkor was the home to more than a million people. At the time, it was probably the largest urban area in the world. Scientists are still puzzled why exactly this metropolis was abandoned. Soon enough, the jungle reclaimed their territory. 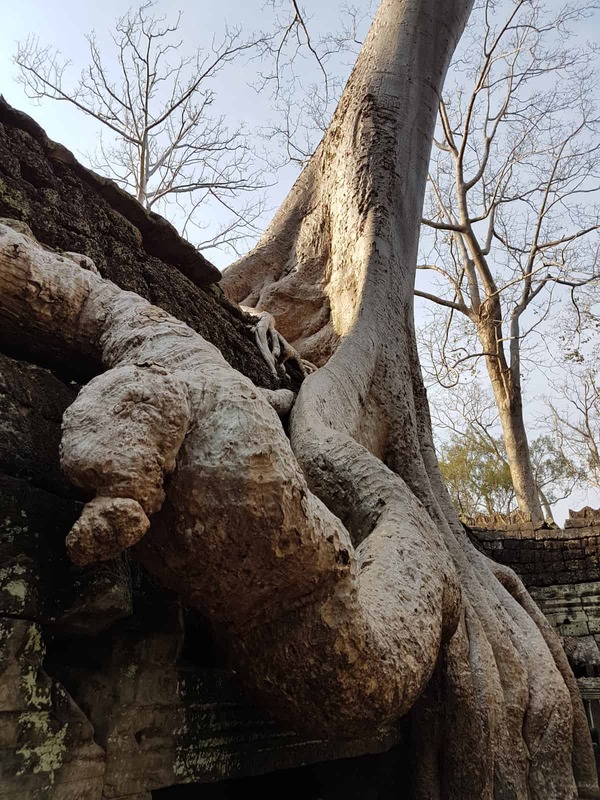 Giant fig trees are growing on the ancient temple ruins that are now inhabitated by monkeys, lizards, and other exotic animals. The area looks like straight out of a Hollywood adventure movie, and in fact it was one of the main sites for the “Tomb Raider” movie with Angelina Jolie. When my girlfriend and I planned our South-East-Asia trip, my only condition was that “I wanted to see Angkor”. 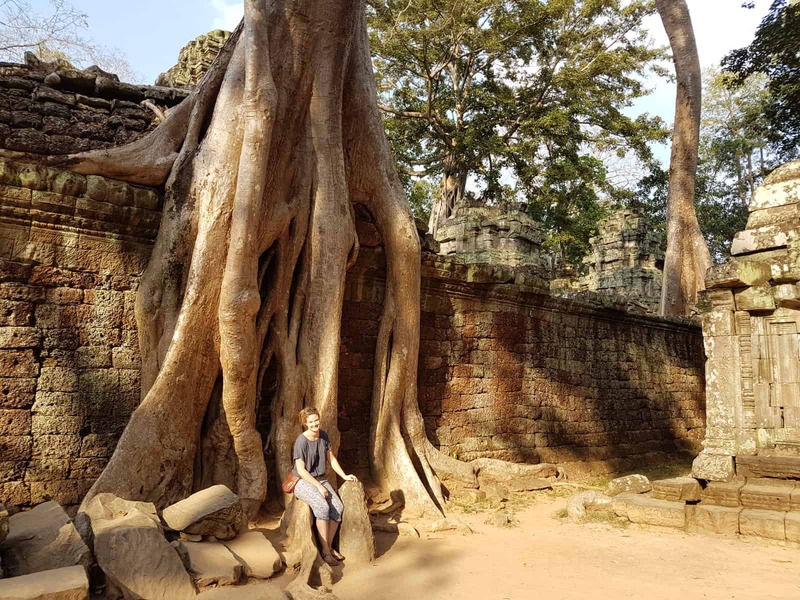 So we planned our entire trip around the Angkor visit. 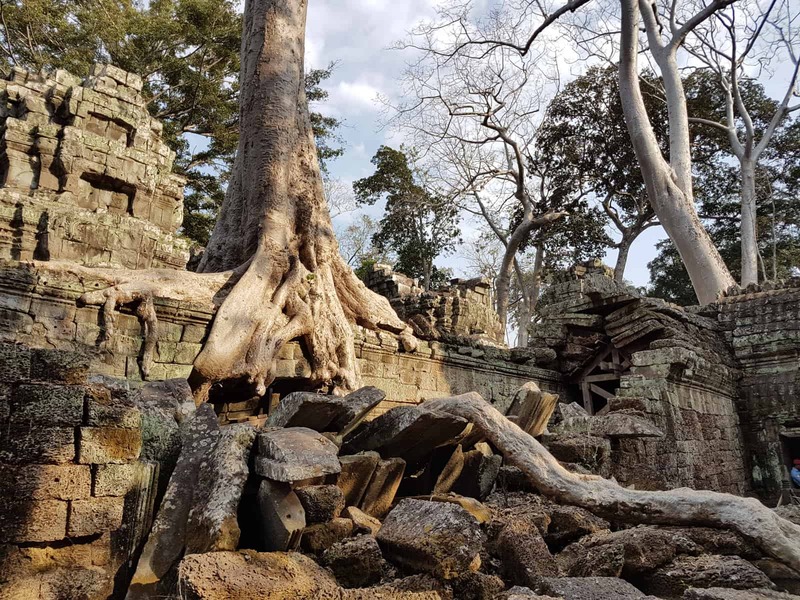 If you want to visit Angkor, you probably have to stay in the nearby city of Siem Reap. Siem Reap has a small, but functioning jungle airport. Following the recommendation of friends, we skipped the exhausting bus journey from Bangkok (our first stop), and took a plane instead. Plane fares are quite reasonable (~$50 one-way) if you don’t mind flying with a local Asian airline. 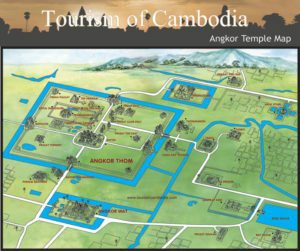 The area of Angkor is huge. If you want to explore it, you either have to rent a Tuk Tuk (approx $15 a day) or rent a bike. Ticket prices to visit Angkor have just been raised and are now $37 for a one-day pass, $62 for three days, and $72 for seven days. I’d recommend booking a three-day pass. However, if you’re really in a hurry (or on a tight budget), I guess you can see most of Angkor in one day if you get up at 5AM. There are two main routes through Angkor. 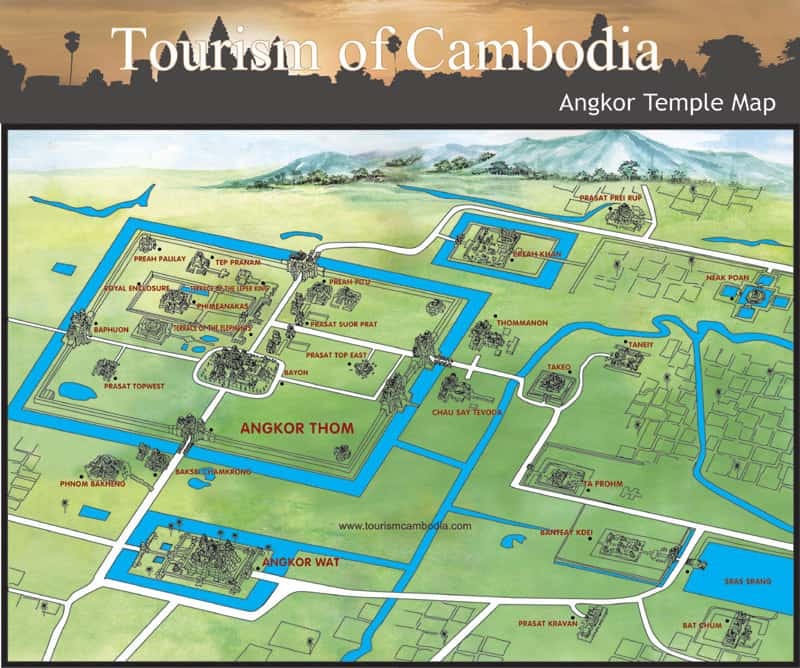 The Small Circuit includes Angkor Wat, Phnom Bakheng, Angkor Thom (incl. 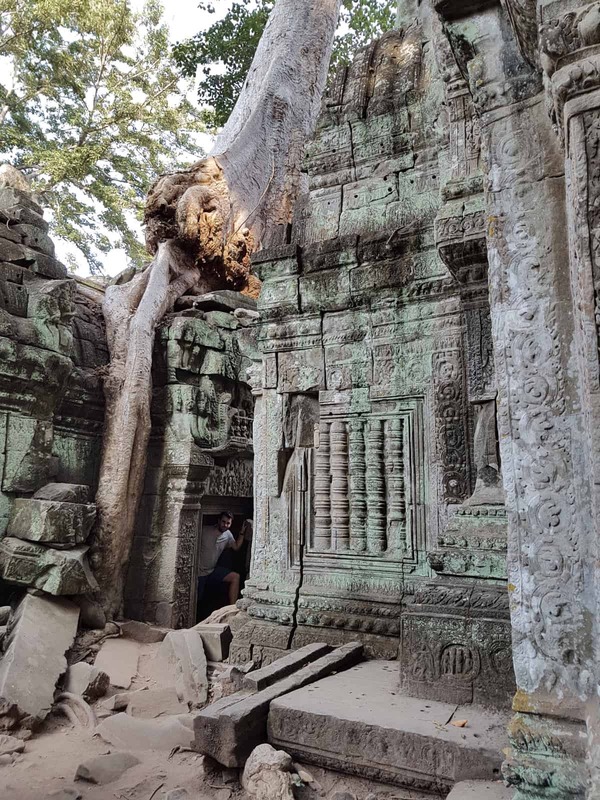 the Bayon), Ta Keo, Ta Prohm, Banteay Kdei and Prasat Kravan. 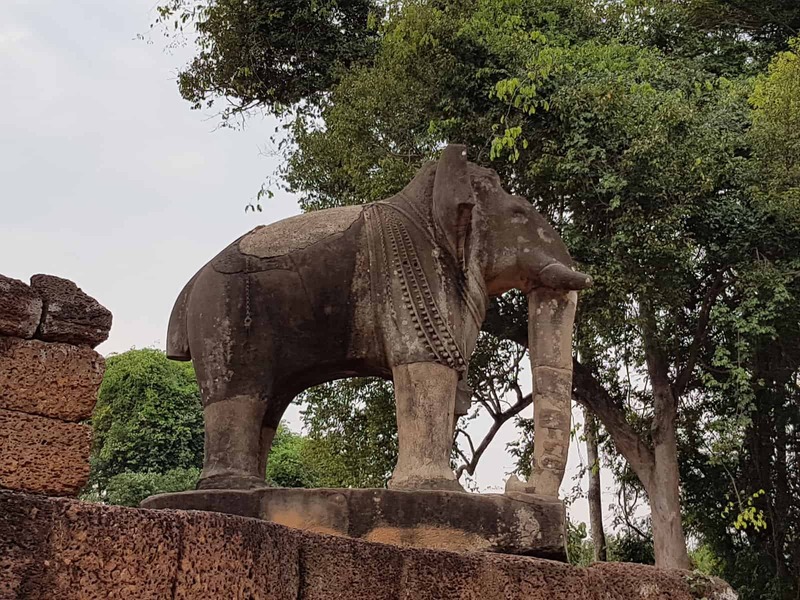 The Grand Circuit also starts at Angkor Wat, Phnom Bakheng, and Angkor Thom / the Bayon, but then leaves through the North Gate to Preah Khan, Neak Pean, Ta Som, the East Mebon, and Pre Rup. 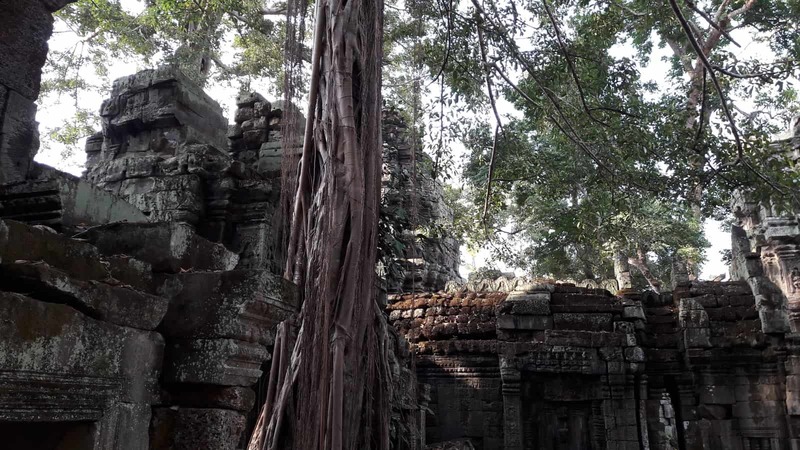 It also ends at Banteay Kdei and Prasat Kravan. 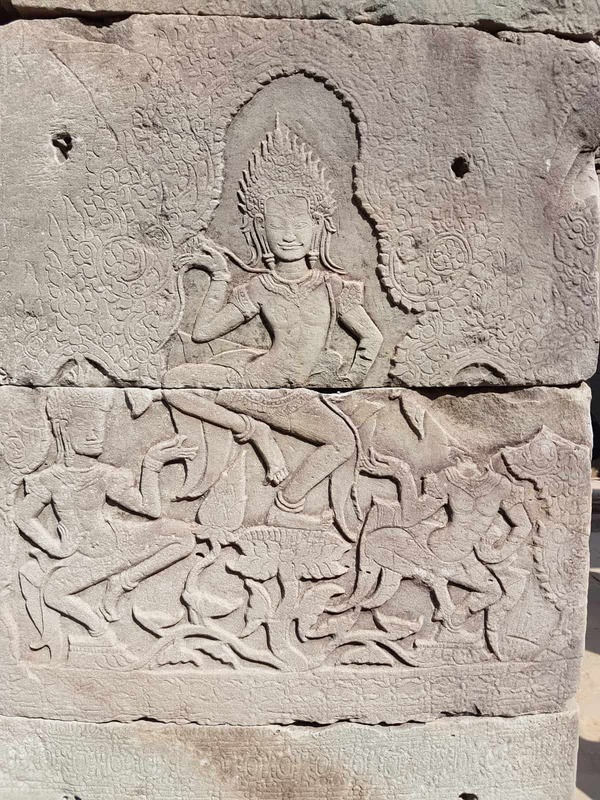 There’s also Banteay Srei, approx. 25km north-east of the main Angkor complex, Kbal Spean (30km north-east of Angkor) and Banteay Chhmar (near the Thai border). We started our tour with the Small Circuit. As for nearly any tour, our first stop was Angkor Wat. Angkor Wat is the main temple of the Angkor complex. It is one of the world’s most famous historical sites. It’s the symbol of Cambodia – its silhouette is even depicted on the Cambodian flag. Following the recommendation of our hotel host, we visited Angkor Wat at lunchtime. 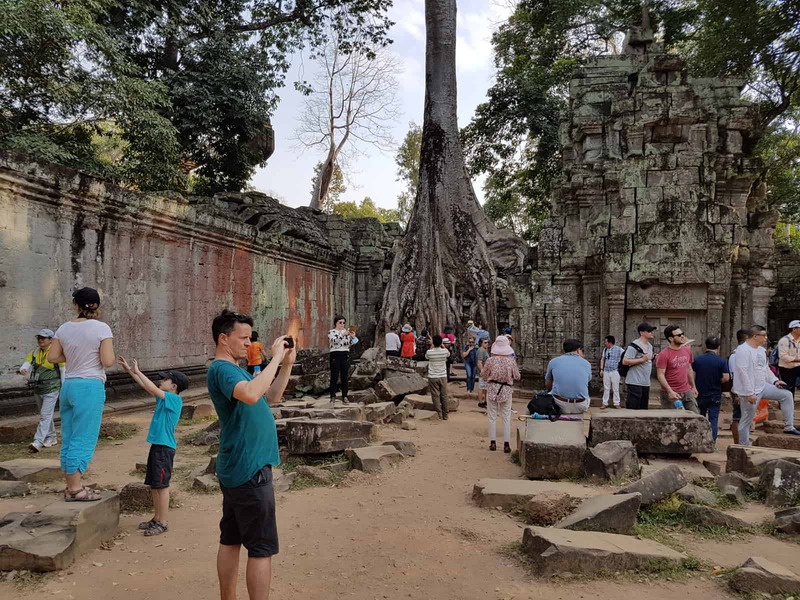 Between 11:30 and 13:00, the masses of Chinese tourist groups are back in Siem Reap to eat, so that you can experience the temple in relative peace. View from the main tower. Angkor Wat is truly spectacular. You can already see the three prominent towers when you arrive at the water basin that surrounds the temple. You cross a stone bridge and walk through the main gate. 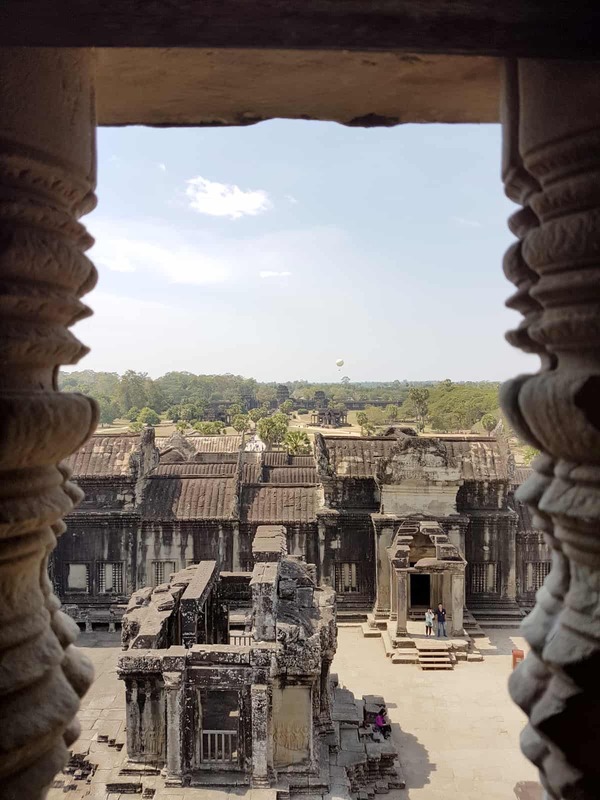 Inside the “outer walls,” there’s a long, straight stone walk, surrounded by two small temple buildings (the “libraries”), two water basins and a large grass area. 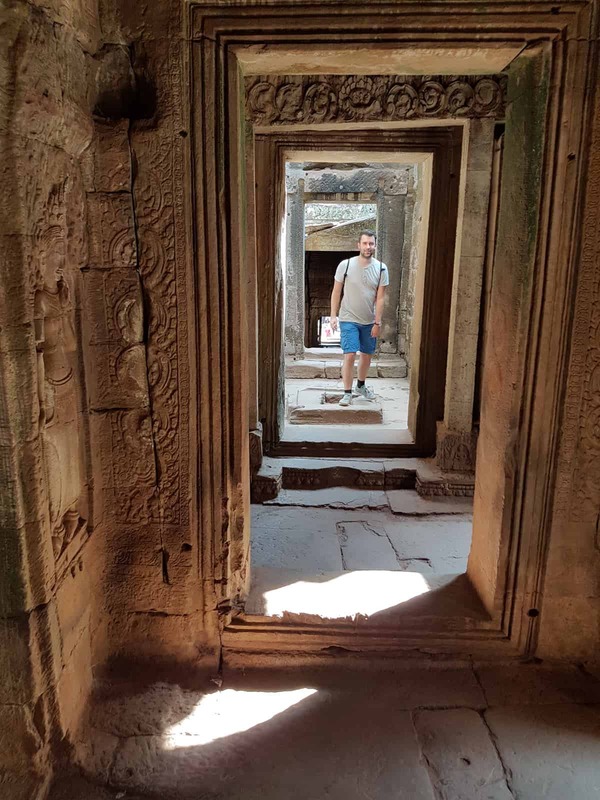 Once you reach the main temple, I’d recommend to turn left to look at the detailed relief of historic scenes of the Khmer empire. It’s also worth to wait for approx. 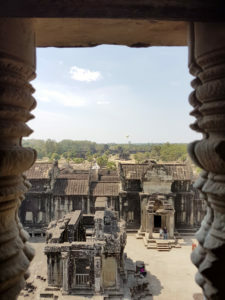 30 minutes to ascend to the main tower of Angkor Wat and enjoy a spectacular overview of the area. 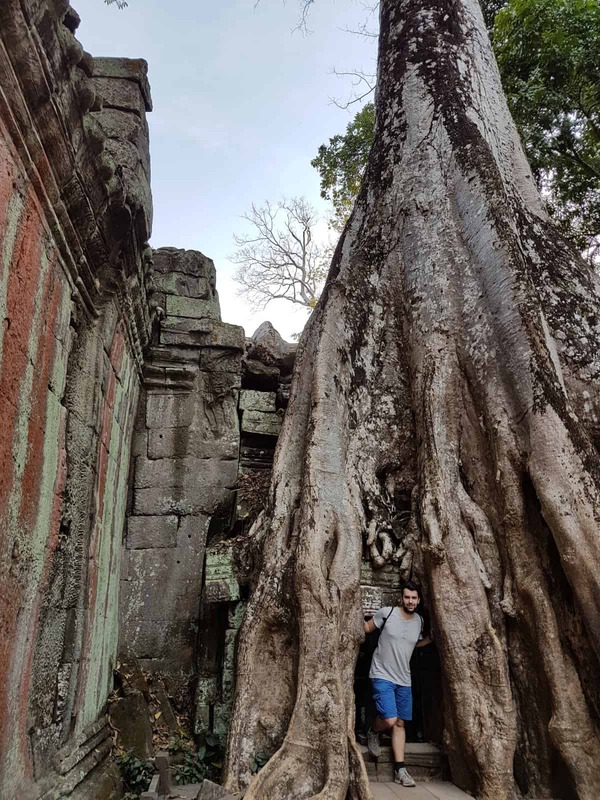 Important: Angkor is a religious site, and if you don’t wear long trousers and a shirt that covers your shoulders, you’re not allowed to enter the main tower. The temple guards actually enforce these rules: They sent away a young Chinese woman who was in line in front of us because her top didn’t cover her shoulders. We still feel it was a good idea to get up that early. 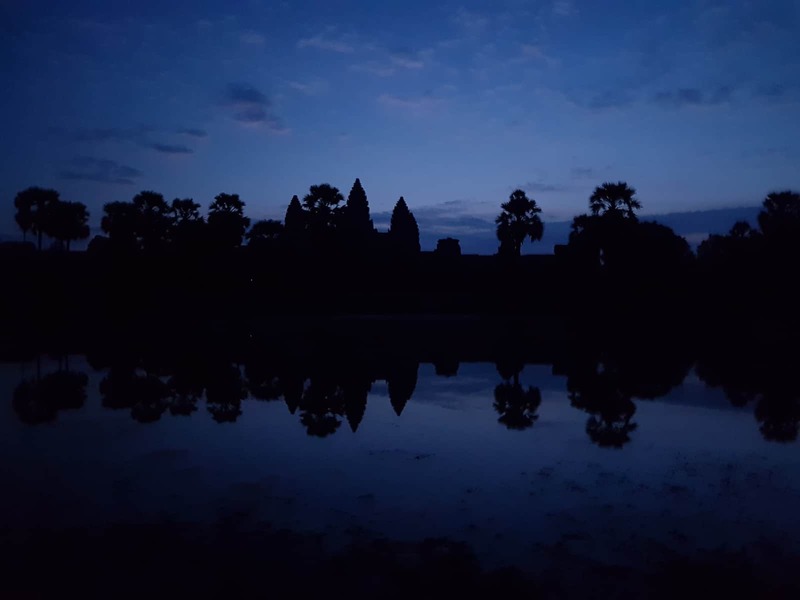 Angkor’s temples offer a fundamentally different experience during different times of the day. 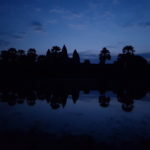 However, we would not go to Angkor Wat to see the sun rise. 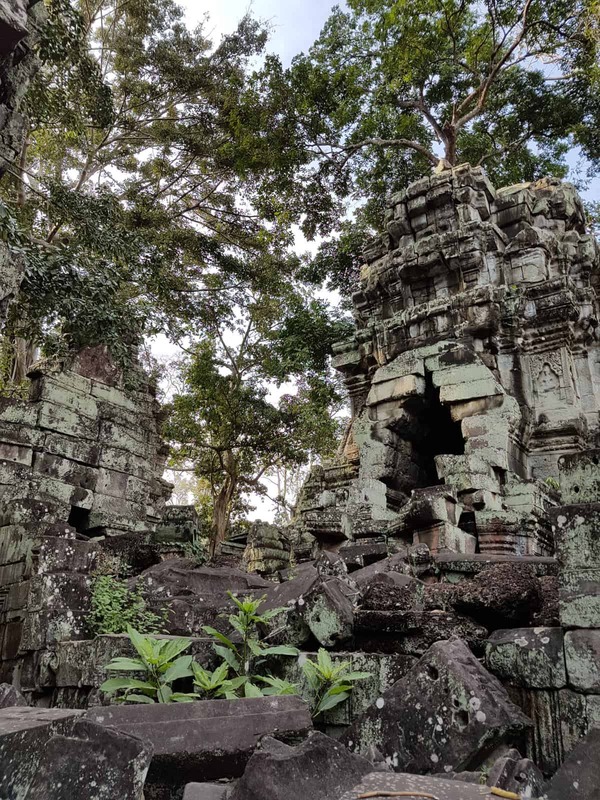 Instead, it’s probably a fantastic opportunity to see Ta Prohm or Preah Kahn in the early morning fog, without any annoying other tourists. After Angkor Wat, the “Small Circuit” continues to Phnom Bakheng. Phnom Bakheng is a small mountain close to Angkor Wat. In the early morning, it’s another popular destination to visit the sunrise with hundreds of other tourists and experiment with camera filters. For the rest of the day, it’s a peaceful, steep 15 minute walk through the jungle with a relatively unspectacular temple on top. We initially planned to ride the mountain on an elephant, but after informing us how badly the animals are treated, we didn’t do it. After Phnom Bakheng, we entered the ancient city wall of Angkor Thom through the South Gate. The sheer size of the area is breathtaking. Angkor Thom, which translates to “Great City”, was the capital of the Khmer empire. It is estimated to have sustained a population of 80,000 – 150,000 people. Nowadays, it’s a dense jungle, interrupted by overgrown temples, small settlements, and the occasional group of monkeys. We stopped in the center of Angkor Thom to visit the Bayon. 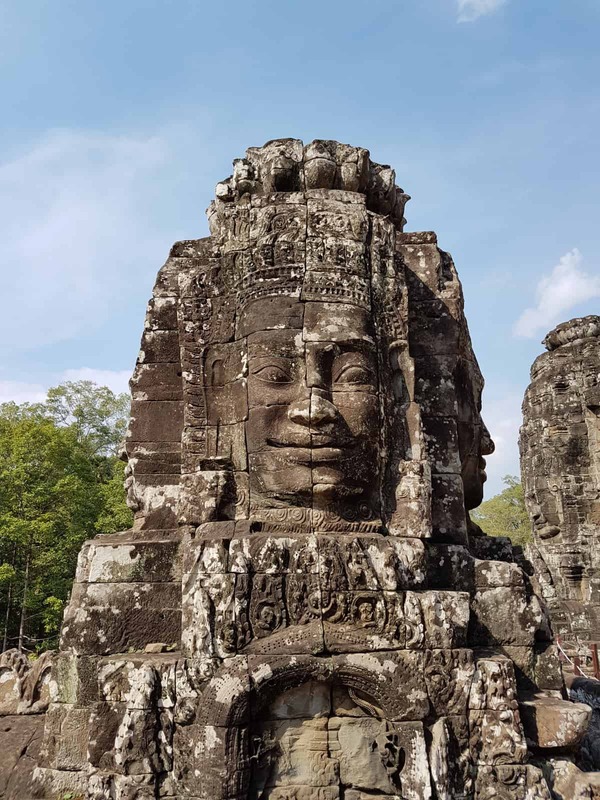 The Bayon is a small temple, full of marvellous reliefs, apsaras, and large stone faces. Due to its many pillars and narrow corridors, it can accommodate a lot of tourists, and yet it still feels private and abandoned. 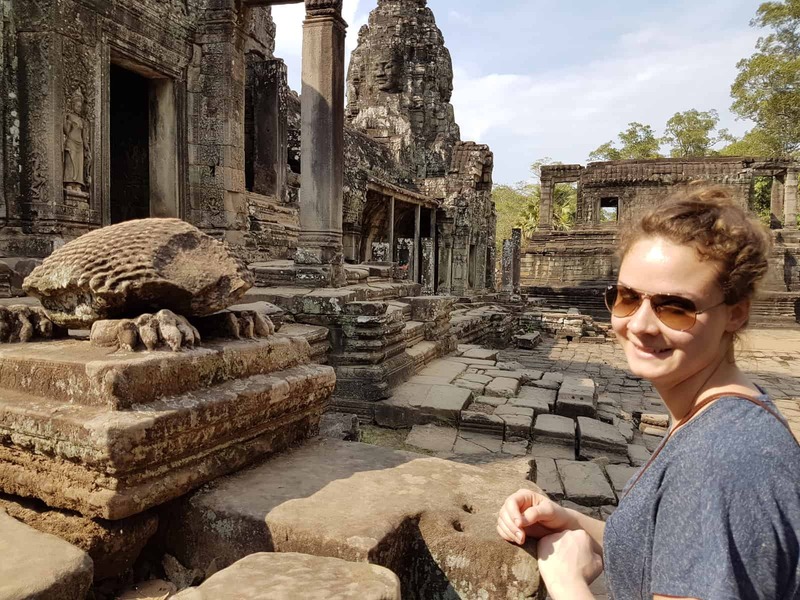 Directly next to the Bayon are the Terrace of the Elephants with life-size elephant reliefs, and the Terrace of the Leper King. From there, it’s just a short ride to the East Gate and the Ta Keo pyramid. Ta Keo was extensively rebuilt with Chinese help. It’s fun to climb the super-steep stairs to the top of the temple. 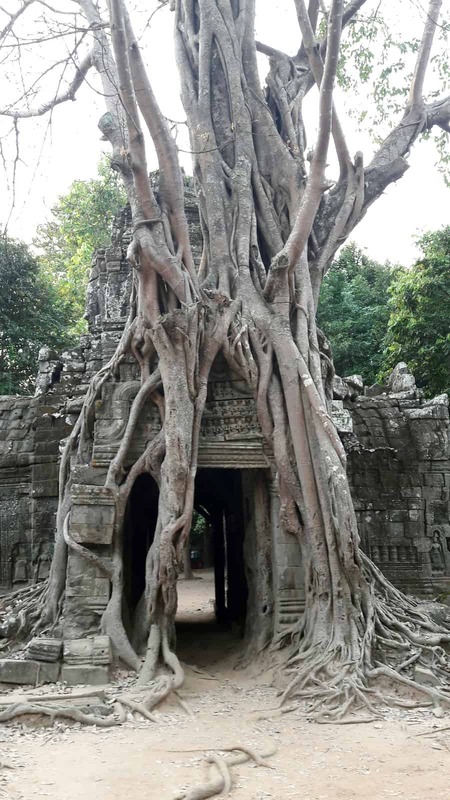 Ta Prohm was our personal highlight in Angkor. Much of the temple is overgrown with plants and large fig trees. It rose to international fame as one of the main locations of the 2001 “Tomb Raider” movie with Angelina Jolie. The main route through the temple is a well-maintained with wooden planks. Throughout most of the day, it is so full of loud, Chinese tourist groups that it is nearly unbearable. We still stayed at the main route for some photo ops. The photos look spectacular, but I think it’s also worth showing them with the surrounding. Fortunately, the Chinese tourist groups stay strictly on the main route. Once you leave the route, you can explore the vast labyrinth of overgrown temple ruins nearly for yourself. We took nearly one hour to walk/climb through most of the temple. There’s just so much to see! The temple looks different behind every corner, and the jungle atmosphere really made us feel like Indiana Jones or Lara Croft. 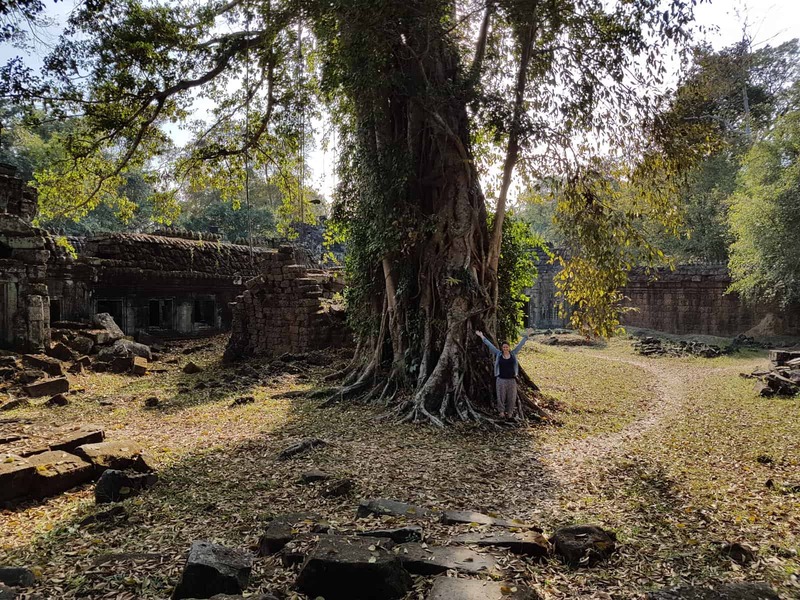 On our second day in Angkor, we visited the remote locations of Banteay Srei and Kbal Spean. Banteay Srei is located approximately 25km north-east of Angkor Thom. It’s a rather small, but richly decorated temple dedicated to the Hindu god Shiva. Our favourite feauture of Banteay Srei were the many cool monkey sculptures that are scattered all over the temple. However, the small compound was so overrun with Chinese tourist groups that we couldn’t really enjoy the visit. We shared an area as large as a small housing block with approximately 300 Chinese tourists, two French tourist groups and about a dozen of individual tourists. To make the atmosphere even worse, the area was constantly blasted with loud contemporary Asian music. A little bit disappointed, we headed further North to Kbal Spean. Kbal Spean is a small sandstone relief within the riverbed of the Stung Kbal Spean river. The reliefs itself are not that spectacular, but the surrounding environment more than makes up for it! To get to Kbal Spean, we had to hike 40 minutes through the beautiful jungle of the Phnom Kulen National Park. We came across a picturesque waterfall and had to climb over large stones and fallen trees. 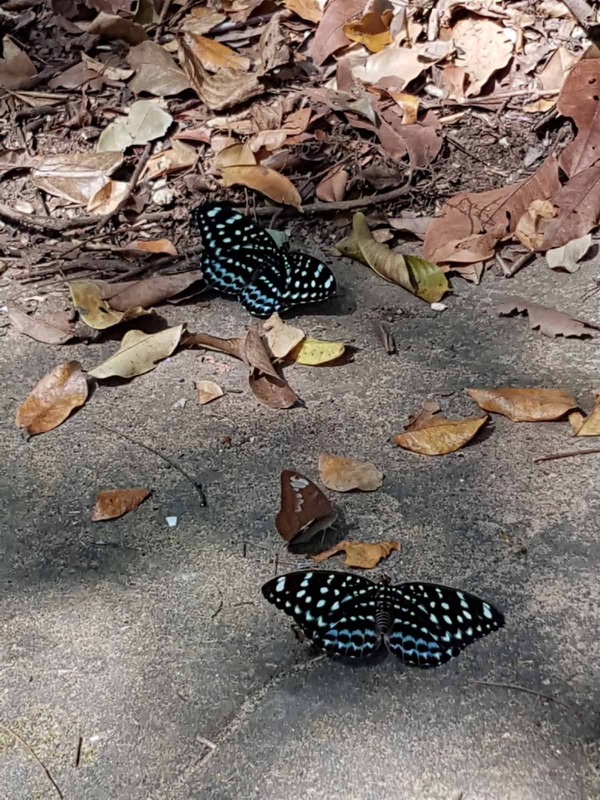 When we arrived at Kbal Spean, we were surrounded by a kaleidoscope of large, colourful butterflies. 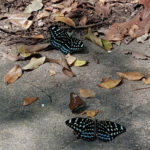 We stayed nearly half an hour at Kbal Spean just to observe the butterflies! Back at the entry to the National park, we had some lunch at one of the local restaurants (with free Wifi! ), and then joined a guided tour at the Angkor Centre for Conservation and Biodiversity. The centre is run with the support of two German non-profits. The tours start at 9:00 and 13:00 sharp from Monday to Saturday and are really interesting and educating. The tours are free, though “a tip of at least three dollars” is requested. On our way back, we visited the rest of the temples of the “Grand Circuit”. 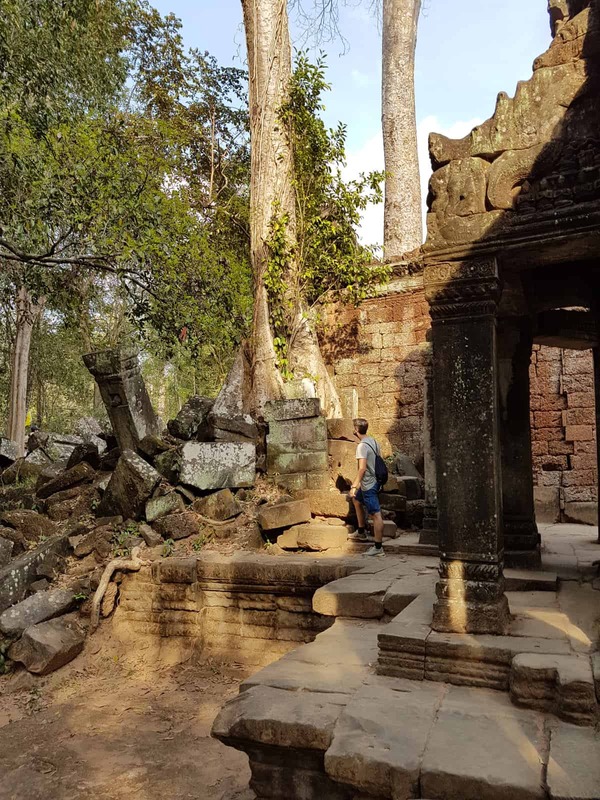 We started with the Preah Khan temple. 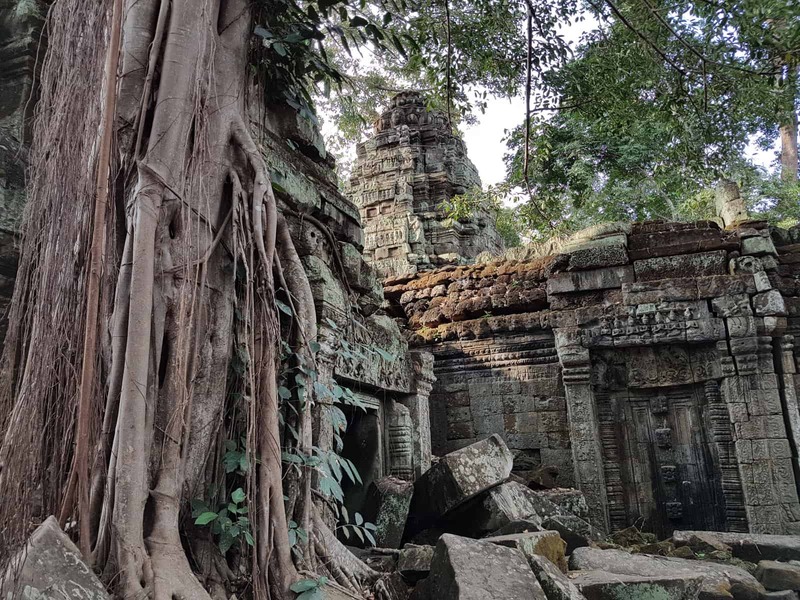 Like the nearby Ta Prohm temple, Preah Khan was left largely unrestored, with numerous trees and other vegetation growing among the ruins. At 15:30, there were just a couple dozen of other tourists in the large temple area. We took a sharp turn to the right directly after entering the temple, and for nearly 15 minutes we didn’t see any other people in the overgrown temple ruins. The path was full of leaves and spider webs, and again we felt like Indiana Jones or Lara Croft, hunting for ancient treasures. Not all the Angkor temples are full of tourists. Even after visiting so many temples, the rest of the Grand Circuit still provided many new experiences. Neak Pean is an artificial island within the Preah Khan Baray (the water basin around Preah Khan). In the middle of the island, there’s a small pond and a water temple. In order to get to the island, we had to cross a wooden bridge which provided a scenic view of the Baray. The next stop was the Ta Som temple. While the temple itself doesn’t offer much to see, it does have one of the most scenic photo locations of the entire Angkor area. You have to walk through the entire temple to get to the eastern temple gate. The gate has been so overgrown by a sacred fig that it’s hard to make out if you walk through a tree or through a stone gate. The East Mebon is one of the oldest temples in Angkor. It features several stunning, life-size elephant sculptures. The elephants were definitly the most awesome sculptures that we saw during our entire South East Asia trip. 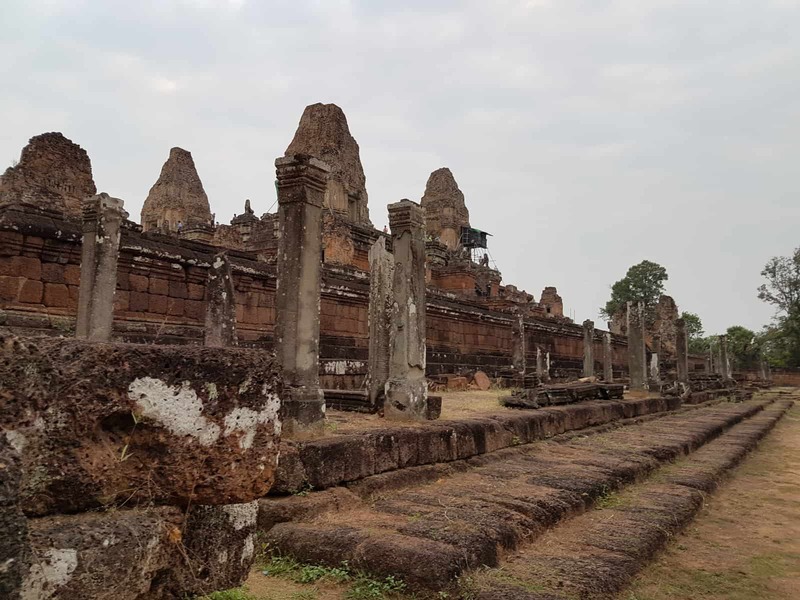 Pre Rup is a large pyramid that provides a fantastic overview of the surrounding landscape. It is a popular spot to watch the sunset, and accordingly has longer opening hours than most of the other temples. Banteay Kdei was our last stop. 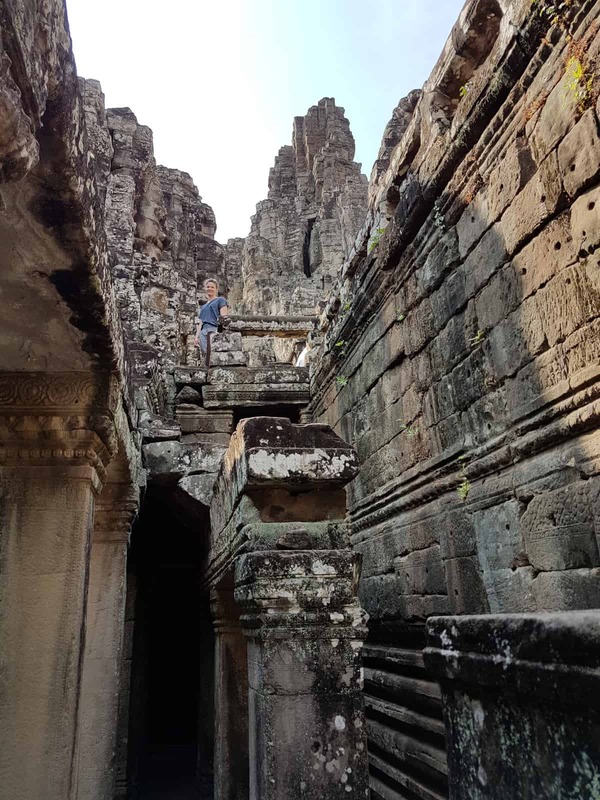 It has a similar architectural style to the Bayon, but less complex and smaller. A massive fig tree again provided a good photo opportunity. Since Siem Reap was our first stop in Cambodia, it took us a while to figure out the prices of everything. To help you plan, here’s the list we made. Enjoy your trip! It has remained largely unrestored, as evidenced by the many trees growing around the ruins and mossy stones left laying everywhere.